The Christmas events begin with two classes from the Flower Shed at Balgove Larder on 1st and 8th December from 9.30am to 11.30am. 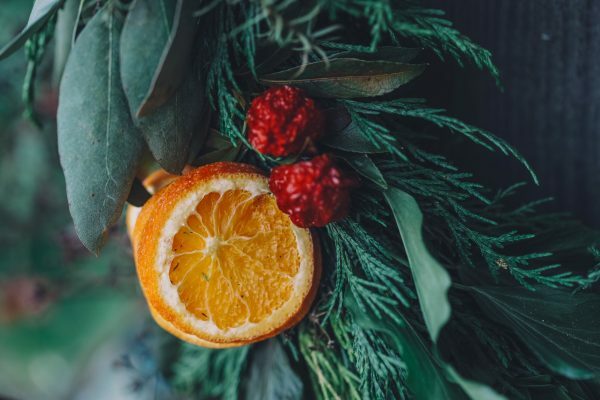 The classes have been specially planned to celebrate the season using festive foliage like holly along with the likes of pheasant feathers, dried oranges and cinnamon sticks to name a few. All materials will be provided and customers will be able to enjoy a complimentary glass of hot mulled wine or spiced apple with a homemade mince pie fresh from the Balgove kitchen while they craft their wreaths. The classes promise a friendly environment and cost £45 per person. Later in the month, Balgove Larder’s Christmas Night Market takes place in the atmospheric Steak Barn on on Tuesday 11th December from 4pm to 8pm. The uniquely refurbished former sawmill with walls made from recycled potato crates will provide a cosy venue with a wood-fired barbecue at its centre. Carefully selected food and drink producers and craft makers will line the barn, showcasing a range of artisan goodies that are ideal for the Christmas dinner table or for special gifts. Carol singers and live music will accompany shoppers throughout. The Night Market is free to attend and with visitors able to choose delicious produce straight off the barbeque and from a range of visiting street food outlets, food lovers will be in their element. Balgove beef burger, lettuce, tomato, relish, twice fried chips & mixed leaves. The menu is priced at £38.00 per head includes half bottle of wine or two drinks per person or £29.95 per head excluding drinks package. Balgove Larder is a farm shop, Steak Barn, Butchery, Flower Shed, Homestore and cafe supplying top quality, local, seasonal produce as well as meat direct from the farm through its traditional butchery. With vegetables grown by hand in the field, meat reared on the farm and cut to order by a team of craft butchers, shoppers will find everything they need for Christmas dinner at Balgove Larder. In addition, the Homestore section provides an innovative range of beautifully crafted gifts alongside a huge array of produce in the Farm Shop. Christmas order forms will be available online and in store at the end of September. For more information on Balgove Larder call 01334 898145, email [email protected] or visit www.balgove.com. Balgove Larder is open daily 9am to 5pm. For press enquiries, images or interviews, contact Martha Bryce on [email protected]; 07905 761 525.